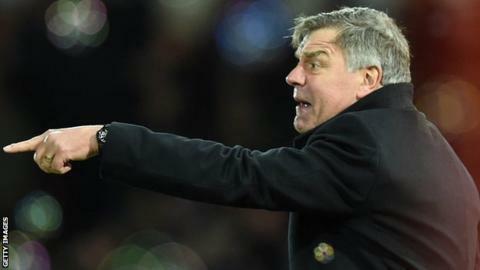 Manager Sam Allardyce says he is planning for next season with West Ham despite his contract at Upton Park expiring in the summer. Media speculation has claimed Allardyce is set to leave, with Marseille boss Marcelo Bielsa among those reportedly lined up to replace him. "I don't know I am going to be here next season," admitted Allardyce. "But when you're contracted to a club, you do the job. One of those roles is to plan for next season"
In May, West Ham's owners set Allardyce a target of a top-10 finish this season, along with a more attractive attacking style after criticism from some of the club's fans. With seven games of their current campaign remaining, the Hammers - who move into the Olympic Stadium for the start of the 2016-17 campaign - are ninth in the Premier League and have scored 41 goals. They scored 45 goals in the 2012-13 season and 40 in 2013-14. However, their form has dipped markedly in recent months with only two league wins since Christmas. Allardyce has been at the club since June 2011, earning promotion from the Championship in his first season in charge and securing 10th and 13th-place finishes in the past two top-flight campaigns.